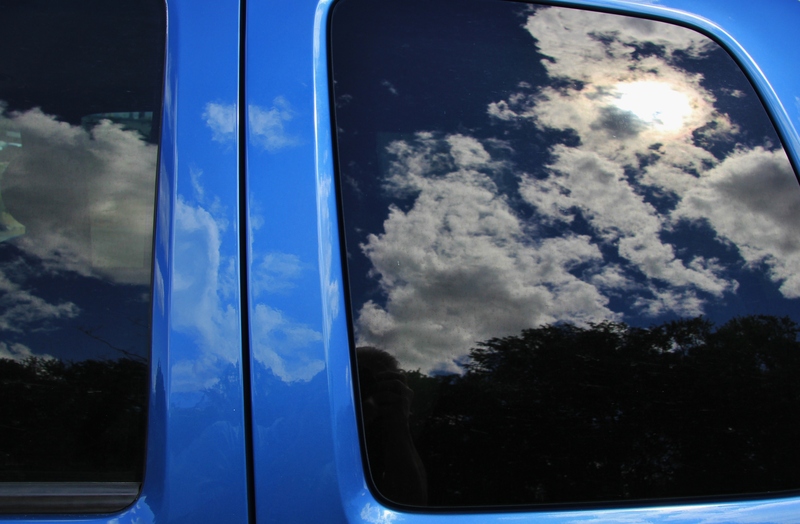 Have you ever noticed how vividly light reflects off of tinted glass, and even clear-coat painted metallic surfaces? Like watching a movie, I gazed at the clouds which strolled by the side windows of my Jeep. They skirted by without even a whisper…only a moving reminder that they existed…for only a short while before fading out of sight. In between the clouds the sun shone in all her brilliance. It was she who illuminated the clouds in the first place. And, it was she who made the reflection possible. No light, no radiance, no reflection. Remember the line in the fairy tale, “Mirror, mirror on the wall, who’s the fairest of them all?”. As I recall, the answer wasn’t too favorable for the wicked queen so she cast a spell on Snow White who was considered the fairest. The queen had a problem which is common among many. She was so self-absorbed that she radiated her disdain for others (in this case Snow White). Her reflection revealed a narcissistic image and the mirror couldn’t lie. How often do we see this dynamic played out in our everyday world? People pretending to be one thing, but eventually they reveal through words and actions what’s really inside them. Rather than radiating light, darkness fills the void. In today’s world of ‘make believe’ where most anything printed or filmed can be (and usually is) manipulated to what the creator wants the subject to look like, we are presented a poor reflection of the truth. Sorry to be sardonic with my opinion, but this is what I often see. This is also a generalization of our culture and not a condemnation of any particular person, although I can think of a few who may fit this description. This got me to thinking about radiance and reflections in general. More specifically, I looked in the mirror and asked myself what I radiate, if anything. Do I have a light within me which radiates outwardly or is there too much darkness that obscures the light? Can others see what I don’t? Or, is there anything to be seen? Is my self-image based on reality or wanna be? As with my vehicle’s color; since it is blue, it better reflect blue or something is wrong. I realize I have flaws, more than I want others to know about. And, I can hide things as well as anyone, except from the One who knows me better than I know myself. With this admission I can also state that it is my supreme desire to radiate light and reflect that which I know to be true. As I stumble in my daily attempts to live out this goal, I need all of the grace I can acquire. So, before you throw a rock at me for this post, I adjure you to look in the mirror, too. If you don’t like what you see, you can throw the rock at the glass or put it down and be honest with yourself. Then, extend yourself some grace before asking for help to change. The clouds will eventually part and the light will shine once again. There are plenty of souls who have cracked mirrors, and continue to radiate beautiful light. I want to be one of them.